Now, I am not opposed to a bit of innovation and certainly do not see any recordings as sacred cows not to be touched by any type of experimentation. However, that said, I do always have an opinion on whether the experiments work or not. For me, and I stress, for me only, I find this is a half and half venture. 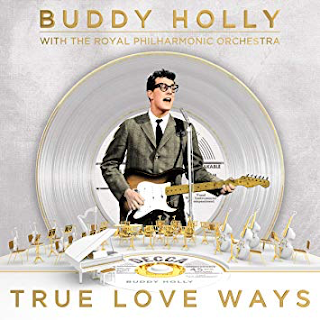 I find the sweeping orchestration and twiddling around with pizzicato string pluckings work far better on those tracks on which Holly already had used considerable orchestration - "True Love Ways", "It Doesn't Matter Anymore" and, notably, "Raining In My Heart". Where it falls down is on the rock and roll numbers, like "Rave On", "Oh Boy", "That'll Be The Day" and "Peggy Sue". Basically, the ones with The Crickets. These songs do not, in my opinion, need any strings. Putting them on there blights the songs, robbing them of their essential rock and roll vitality and raw edginess. The string plucking in "Peggy Sue" is just annoyingly superfluous. The "solo" Holly songs were beautiful anyway and are rendered more so by these new orchestrations. Although, as I said earlier, these songs were pretty well orchestrated anyway. "Raining In My Heart" possibly now has too much added to it, however. I have to say that I find "Everyday" interesting and quite quirkily appealing, though. Furthermore, the sound quality is outstanding throughout. "True Love Ways" provides an excellent example. Many people will enjoy this album and it will allow them to re-visit Holly's wonderful musical legacy. If so, fair enough. I am not going to criticise them, or the album. It is just that, personally, I will stick with the originals.